A reliable internet connection is a must for businesses today—it’s how you stay up and running, it’s how your company keeps up, it’s how you stay in business. 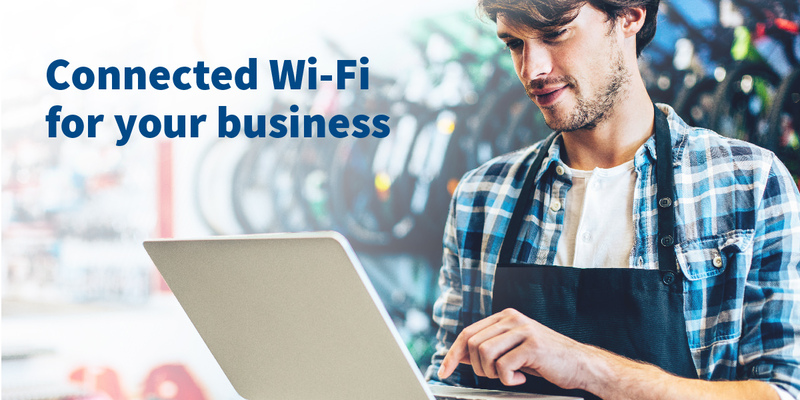 A great internet connection with sufficient speed to support all devices and users—many, if not all, on your workplace Wi-Fi network—is crucial. Managed Wi-Fi from PTC lets you rest easy as we set up and maintain your Wi-Fi network to maximize performance. Q: I already have a router, why do I need another one from PTC? Q: Why should I pay a monthly fee after I get a PTC router installed? A: Routers are electronic equipment and, as such, have the potential to stop working or work with reduced efficiency. If you add more wireless devices over time, it can impact the performance of your wireless network. With PTC’s Wi-Fi services, we maintain the router to make sure it operates at peak efficiency. If necessary, we replace the router free of charge. We provide regular router software updates, and our technicians can diagnose and troubleshoot issues remotely. A: People often use the terms Wi-Fi and internet interchangeably. Wi-Fi and internet are two distinct services and knowing the difference is important: the internet is a network that connects computers around the world. To access the internet, you must subscribe to service from an Internet Service Provider (ISP) such as PTC. A Wi-Fi network is independent from the internet. The devices in the network connect wirelessly to a Wi-Fi router and together they form a wireless local area network (LAN). The Wi-Fi router is connected to the internet source via a broadband modem (in some cases the modem and Wi-Fi router are one piece of equipment). Devices connected to a Wi-Fi network can work together and share information. You control your Wi-Fi network, including where you place your router, security restrictions, determining what devices can access it, and which devices can share information with other devices.